How often last year did we have cause to reflect something akin to 'thank heavens Mercedes isn't micromanaging races like Ferrari used to'? The sport had (and has) enough things to tear itself apart over, one can only imagine what a repeat of 2002's on-track entertainment levels would have done to an already combustible situation. The intriguing Lewis Hamilton vs. Nico Rosberg battles - in large part a result of Mercedes to its credit then letting its drivers get on with it - in many races as well as in the championship overall, rather rescued us. 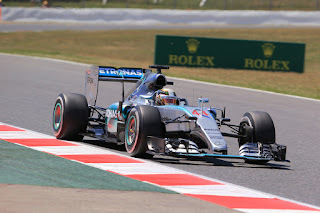 Indeed of this Mercedes boss Toto Wolff spoke of his responsibilities to the sport as his silver cars dominated. How quickly things can change. 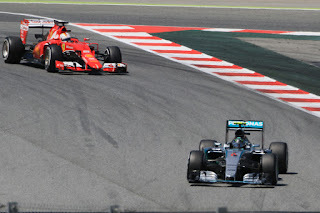 Mercedes still dominates of course, and in fairness hasn't quite gone to the extent of Ferrari's paranoia of yore. But on the evidence of today's Brazilian Grand Prix at some point it has ventured a way down the same path. Being sensible so to not lose points is one thing, but throwing a wet blanket over the race as Mercedes did today is quite another. One thing to say before we go further is that it would be unfair to suggest that the eventual outcome of Nico Rosberg beating Lewis Hamilton to the Interlagos win was impacted by this. 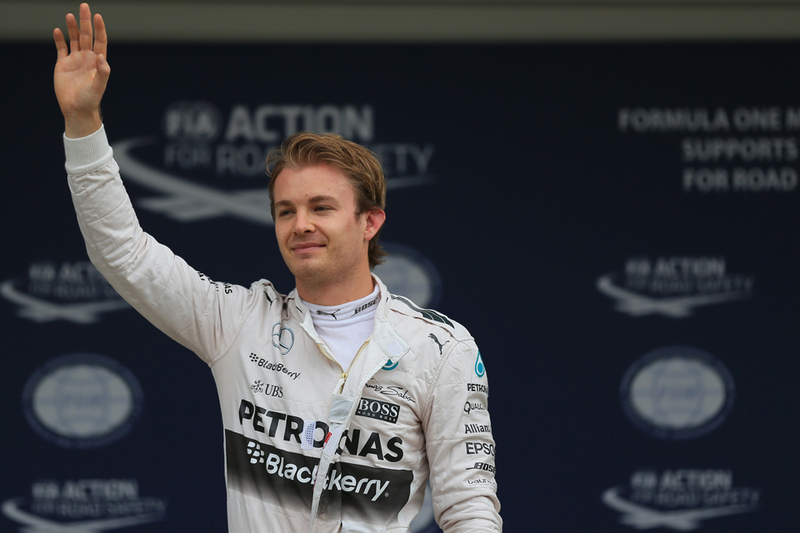 Nico has for much of this weekend looked to have an edge on Lewis - certainly when it mattered - and deserved his win. He also has been in superb form lately and his showing this time was mere continuation. And for all of the talk afterwards of strict Mercedes orchestration it of course is a long way from clear whether Lewis would have usurped him if he had been allowed to go a different way on strategy. Indeed the evidence we have leads us to doubt as much and severely. But equally it would have provided much-needed diversion to watch him try. The race indeed went pretty much exactly as Lewis had predicted after qualifying. At this track it is hard to follow the car ahead and indeed Lewis was heard on the radio today complaining about that fact. This is in particular through Mergulho, which is not long before the main straight and the glaring overtaking point at the end of it into the Senna S. Therefore his realistic opportunities to usurp his team mate were at the start and on strategy. He didn't do the first as Nico abruptly covered the inside line at turn one. And one way or another he couldn't do the second. Having followed his team mate at a respectful distance at around a third's distance Lewis asked to be put onto a different strategy in order to help him get ahead. After apparent deliberation his engineer replied saying that he could do an offset if he liked, that is stretch out a stint longer and therefore attack potentially on fresher tyres later. But he added that running on a different compound to his team mate was a no-no. And whatever is the case it didn't help that Lewis experienced higher degradation than Nico, which rather precluded the 'stretch out the stint' thing (let alone anything more outlandish such as doing a stop fewer) as well as meant he tended to drop some way off Nico at crunch time at the end of each stint. But in any case the Mercedes team with both cars shadowed the strategy in Sebastian Vettel in P3 of stopping three times with what seemed almost slavish obedience. Rounds of stops two and three mirrored each other exactly - Seb came in one lap; Nico the lap later; Lewis the lap after that. Stop one only varied in that Nico and Seb stopped on the same tour. At one point Lewis's engineer spoke of 'Hammer time' and raised our hopes we'd see some abandon finally, but the Hammer time lasted only for a lap. 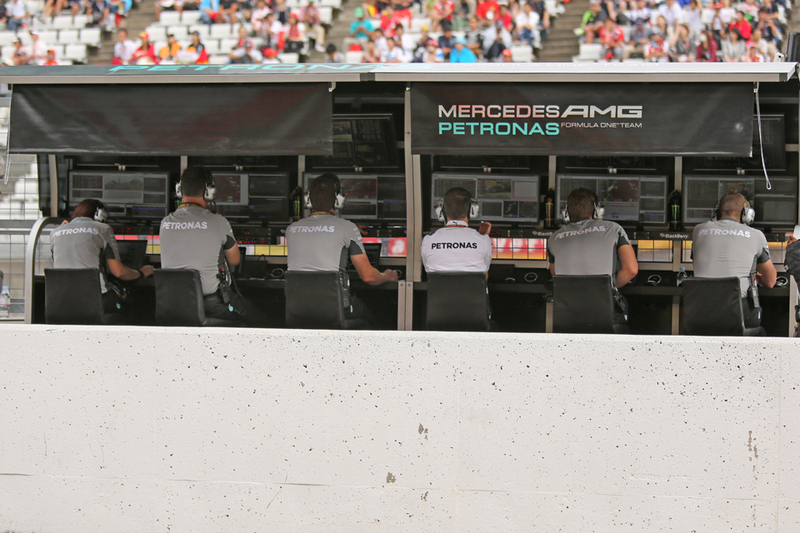 The race for first place was being managed precisely from the Mercedes pit wall it seemed. About the only chance of variation was snuffed out at source. "You need to look at your enemy, your competitor" said Wolff afterwards in explanation, "you don't want to risk your team result, P1 or P2 against Vettel who is in P3, because you're experimenting". What we got today in Brazil was like Mexico's race, only much more so, in that you could see the theoretical sense of the Merc approach in reducing the threat to its two cars finishing in the top two places with minimum fuss. Yet it didn't do all that much for the spectacle for the rest of us, in fact it dampened it even more than then. And another common modern F1 bugbear we hear is the view that drivers operate under strict constraints provided by their engineers these days, rather than having any expectation, or indeed any opportunity, to work it out for themselves. Lewis today wanted to work it out for himself. Let him. It's not like Merc has never done this sort of thing before either. Remember Bahrain last year? 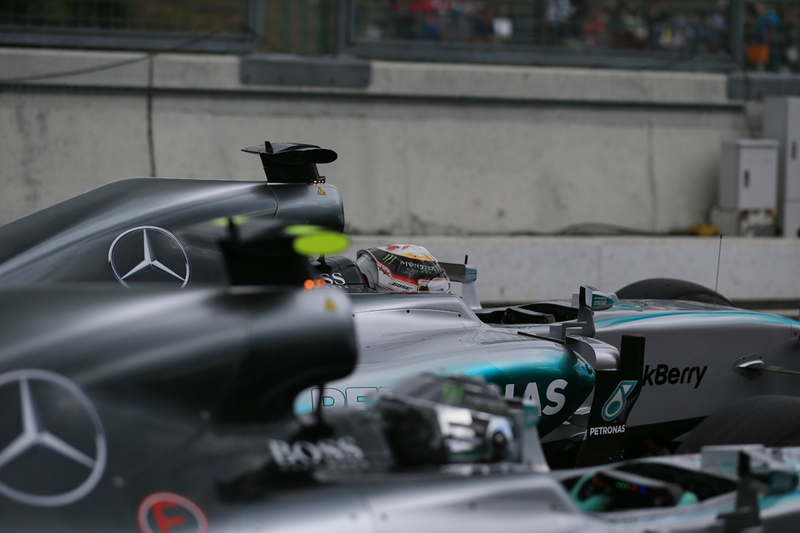 And that amazing battle between Lewis and Nico? Well that owed much to a similar strategy split that Lewis seemed to be asking for today, with Nico then taking the medium instead of the soft in the middle stint giving him softer tyres than Lewis to attack him at the end. Something similar happened in Spain too. We should be clear on a couple of auxiliary things though. In my view claims post hoc that this reflected favouritism for Nico for whatever reason, perhaps aiding him to tie up second place in the drivers' table (which he indeed confirmed today though Merc bosses denied this was part of the strategy considerations), were wide of the mark. Simply, as outlined, it looked like almost farcical levels of risk mitigation, both in of itself and considering that really the team had little to lose. In other ways today's fare wasn't quite like Mexico either. While then the fight at the front was a simple case of in a Mercedes demonstration run leader Nico reacting to whatever attempts Lewis made behind to get with him, while there was still a lot of that today things fluctuated rather more. There was a spell after their first stops when Lewis closed right in on his stable mate and Nico looked for a while like he might have a brake problem (afterwards all explained he was only nursing his tyres) as Lewis was taking metres out of him under braking for turn 1. But later Lewis fell away again and if anything even more quickly than he'd caught him previously, related it seems to the degradation mentioned. It was almost the same story in the final stint too, with Lewis reckoning that time he might have damaged his car's floor a bit as well. By the end Nico had streaked some eight seconds up the road. Nico is positively beaming right now, as well he might. "It feels great to win the races, for sure" he said. "Two in a row now, with pole positions as well. It's just going a lot better at the moment, which I'm happy about that. "No issues. It was just controlling the pace - never overdoing it, not to risk doing a mistake and also to not risk having too much degradation. We saw Lewis dropping off a lot with degradation in the second stint and that confirmed that it was important to take care of the tyres." It seems too he has stopped pretending that all this doesn't have significance for when he and his team mate take up again properly next campaign. "It's always better for next year to end on a high" he added. As for Lewis, "ultimately I didn't do the job in qualifying" he said afterwards. Ah, we're back into the balmy days of the noughties wherein race results are in effect decided on a Saturday. Years on and several attempts - and some extreme ones - later we're no closer to solving the problem of cars being able follow closely in another's turbulence, allowing racing cars to race. "I had good pace, it's just you can't overtake here" he went on in this very vein. 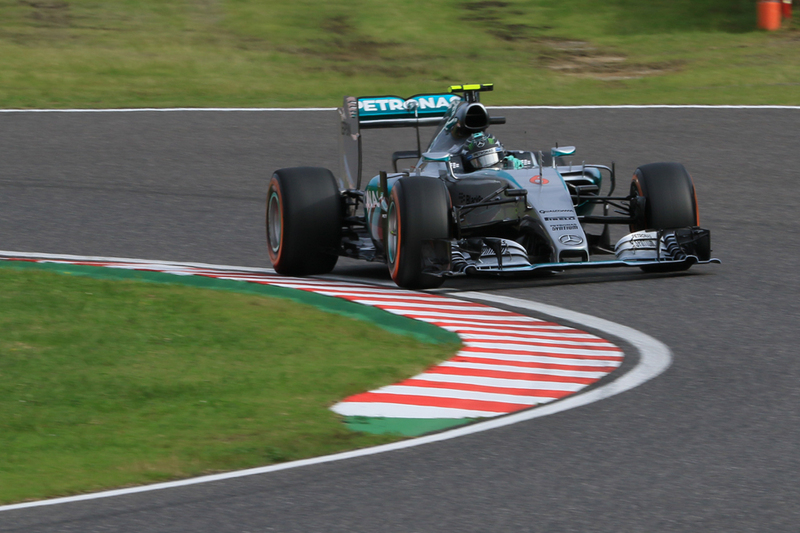 "I was behind Nico and in traffic for some time, so I just killed my tyres. It's a shame because it's such a great track but you can't get close enough in the race. "I don't know if there's other people overtaking, but unless you've got a huge advantage on the car in front...Motorsport is about fine lines, that tenth of a second, but you can't get close enough within that tenth of a second to fight. It's a shame, because it would be good if we could do some overtaking here." The whole strategy business outlined hadn't escaped him either. "I'm here to race, and when you have to do the same [strategy] it's kind of set from the beginning" Lewis said on the podium. "For sure, if there's any other strategies, let's do it, let's take a risk, let's do whatever, they're [the Mercedes team] like 'look after the tyres', I'm like 'no I'm racing!'. I think that's what people want to see, but unfortunately today as I say I couldn't get close enough to be able to put on a great race. "It was relatively boring following in a tow." We noticed, Lewis. We noticed. He expanded on the very subject in the press conference afterwards too. "It will be great to sometimes be able to do something different rather 'you're in on lap 15 and you're in on lap 16'. Have some options and see how it plays out." Nico's comments in response were curious. "It wouldn't be fair for the guy running second to go for another strategy and for it to turn out it was massively the better strategy. And you won the race just because of luck and the other strategy being so much quicker." But, Nico, that's part of the game, isn't it? 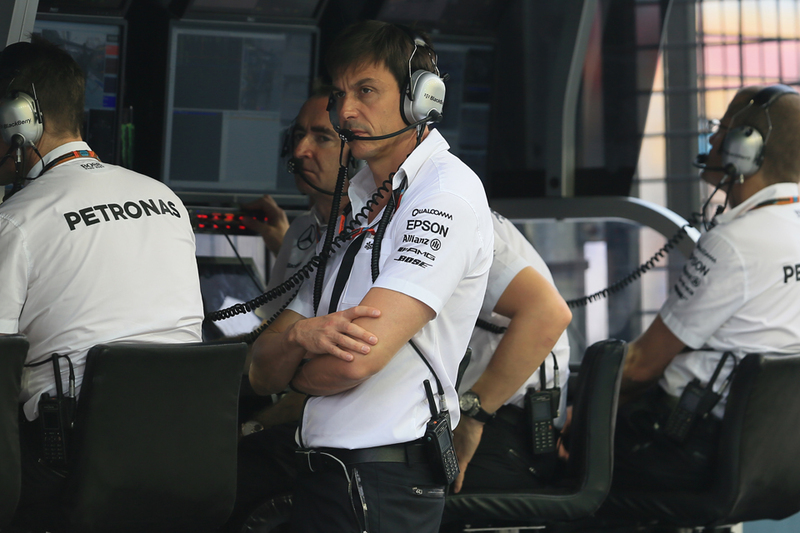 Yet it seems the prevailing view at Mercedes. The team's technical boss Paddy Lowe in the race's post mortem did indeed talk the language of keeping everything above board and even-handed, as did Wolff. 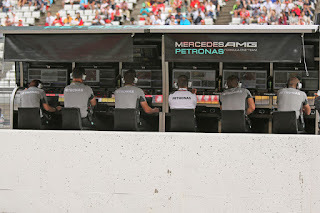 "If you start splitting the strategy, the controversy you create within the team is very bad" Wolff said, "because first of all one might get the right call, the other one will get the bad call, then you have to discuss why one driver had Strategy A and the other had Strategy B". Perhaps with the Lewis-Nico run-ins we've had, and the frenzied reaction inside and outside of the team to them, all have actually brought this on themselves. As for the point that they can let go a bit with the championships sewn up, Wolff again spoke of keeping the balance even as doing that might create a "precedent". Nico was closer to the mark when talking about the race as it was. "I had the pace advantage over Lewis, so he wasn't going to come past me," he said. "I was six seconds in front at the end. He's not going to pass me with that pace". Needless to say Lewis didn't agree. Nico added later too the point that Lewis's tyres falling off as mentioned made most other strategy points moot. "The way Lewis was driving, as you saw, a couple of laps later his tyres just completely died" the German observed with a little glee. And once again Nico played the question of his improved form more generally with a straight bat. "I don't have an exact explanation unfortunately, otherwise it would make it all a lot more simple. But of course I've been working at it a lot, because Lewis had the upper hand for the first part of the season and so, yeah, I'm pleased that it's turned around at the moment." Lewis though added another dollop of intrigue here too. "Well, from Singapore onwards there's been a change to the car" he said, "but whether or not that's made a difference, I don't know really. We'll have to see. But it has changed since Singapore." Lewis also denied that with the championships done he'd relented to any extent. "It's funny how journalists always take one little thing and they run up with it [after Lewis said yesterday after qualifying that his "main job is done this year"], it's not that I was saying my job was done for the year, that I'm not trying. I came with the same fire, the desire to win this race as I've done the whole year long. And trust me I did everything that was possible in my ability today". There was a similar paucity of racing much of the way down the order too. To think time was that Interlagos used to give us more action than the half dozen races around it combined. We can't blame the track in other words. The real culprit is aerodynamics. As it always was. It didn't end there. 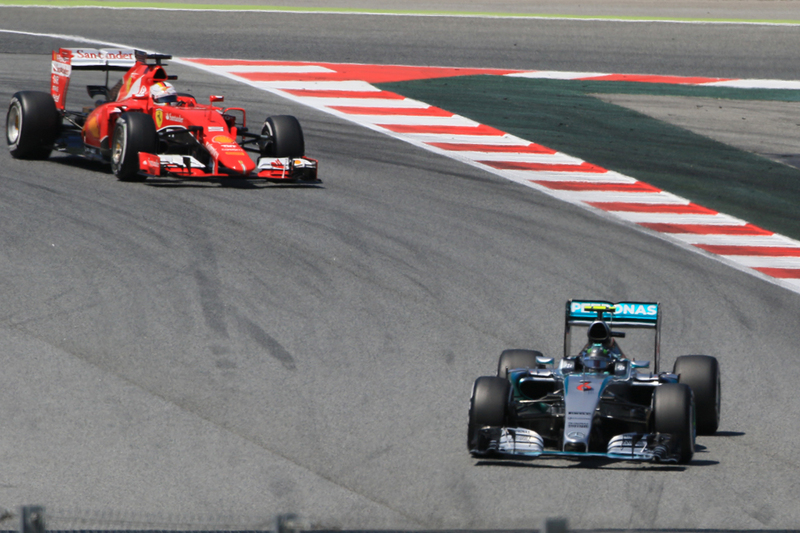 Today only the Mercedes and Ferraris finished on the lead lap, with Valtteri Bottas in P5 a tour down. Granted it's a short lap here, but it's not a good look. And even the usual 'we should applaud them for doing a good job' defence looks curly at the corners these days given the ongoing concern about this manufacturer pair having too much power - politically and otherwise. I suppose if today's tepid fare did anything it swung a lamp over a few of the sport's most pressing problems right now. But then again not everyone is too confident in what is being brewed for 2017 to 'solve' these. There was yet more unwelcome news afterwards when Felipe Massa was disqualified from his home race and his P8 finish for his right rear tyre being 0.1psi above the minimum starting pressure and a whole 27 degrees above the maximum temperature - those new limits introduced at Monza striking. A few reckoned that with a tyre that hot there is no performance advantage to be had (indeed it is a wonder it didn't blister). Williams is to appeal. Even before this was confirmed Massa described it as a "Brazilian race to forget for me". Thank heavens for Max Verstappen though. He almost alone didn't get the 'you can't pass' memo and thrilled us as usual on the way to the final point which was doubled by Felipe's misfortune. Some of his passes at turn one were thrilling. At least in terms of driver skill the sport's future - and present - is in good hands. Suggesting as some did during today's race that the dull show was down to a lack of pilot ability and bravery is another red herring. There also was good news that Force India today confirmed fifth place in the year's constructors' table which also is its highest placing under this guise. Perhaps we forget sometimes what a fantastic job the Silverstone squad does. As Martin Brundle and others pointed out pound for pound (in every sense) it rather puts a few other teams to shame, and has done consistently for a while. It was pushed over the line today by the other Nico, Nico Hulkenberg, who went well as he always seems to here and got P6. Vettel too deserves mention for once again doing everything he could, and once again P3 was his reward but he was just 14 seconds off Nico at the end. 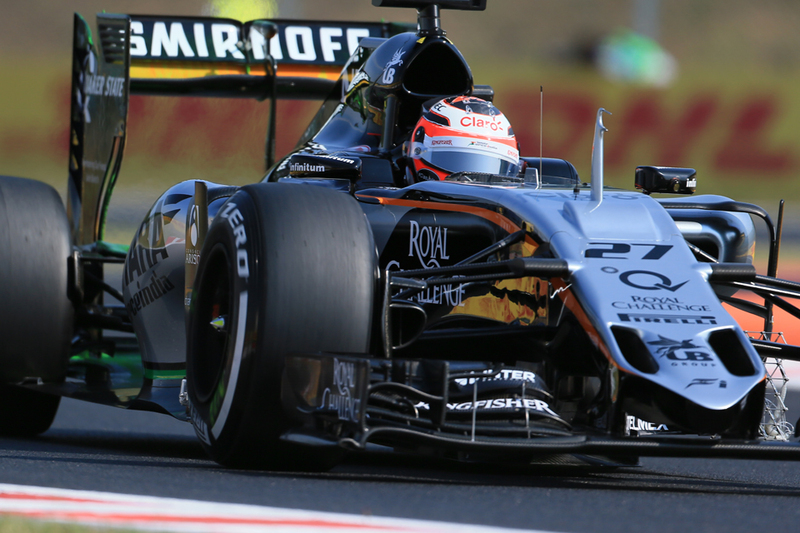 He also crossed the line a mere 33 seconds before his team mate managed in P4. So not everything is bad about this game. Not quite anyway. Nor as outlined was there much wrong with Rosberg's latest fine victory. 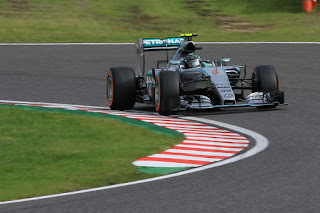 But the suspicion lingers that had Mercedes let go somewhat we could have had a rather better race with it.